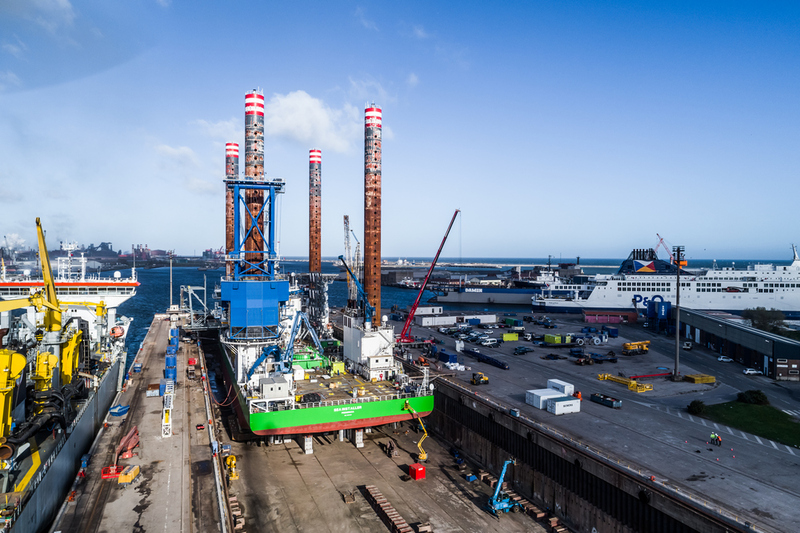 Damen Shiprepair Dunkerque (DSDu) has completed an eight-day refurbishment project for the 132-metre DP2, self-propelled, jack-up vessel Sea Installer. Operated by A2SEA, which was purchased in 2017 by DEME’s subsidiary GeoSea, Sea Installer was purpose-built in 2012 for installing the next generation of large wind turbines off the coast of Europe. The primary task was the fitting of new spud can shoes to the vessel’s four columnar legs. These massive pieces of steelwork, weighing 160 tonnes each, required the deployment of specialist logistics including the use of self-propelled modular transporters to move them into position and a 700-tonne crawler crane. While Sea Installer was in the drydock at DSDu, the client also took the opportunity to prepare her for the next contract. This required a substantial amount of steel work related to the installation and securing of equipment on deck including stairs, grillages and containers. Sea Installer also had her thrusters overhauled and her external paintwork was refreshed with the branding changing from the blue and white of A2SEA to the green of DEME. Sea Installer is now employed on the installation of 42 Siemens 7MW wind turbines at the Rentel offshore wind farm off the coast of Ostend, Belgium.